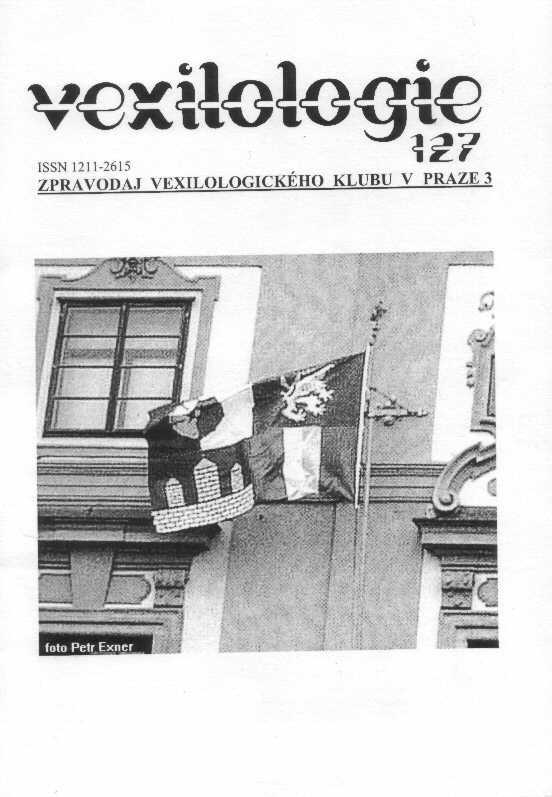 The only contemporary flag facing adversity of its fate for so long time is dealt in this article written by Father of Czech vexillology - Josef Česák. Already in 1939, then the Czechoslovak flag was determined by Nazis to be dumped forever. But it survived WW II and had been re-adopted as a symbol of restored Czechoslovakia in 1945. Also ten years ago, a white-red flag with a blue triangle in the hoist had to go down the river. However, the Czech Republic formally relinquishing the Czechoslovak flag adopted it astutely again as "abandoned and vacant" in order to transform it to the Czech State Flag. Such a dishonest approach may be justifiable only through important moral and/or practical reasons; they are presented in this article. Symbols of next four regions of the Czech Republic - Central Bohemia, South Bohemia, the Zlínský and the Plzeňský regions - are dealt in the third part of this series. Central Bohemia is the only region without representation of its administrative centre in the arms because Prague is not part of it despite hosting of its authorities. Therefore the Przemyslide black eagle with red flames has to stand in the second silver quarter for location of the ancient Przemyslide princedom on the area of the present region. Two blue wavy bends in the fourth silver quarter symbolize main Bohemian rivers - the Elbe and the Vltava - and their colour completes national tricolour. 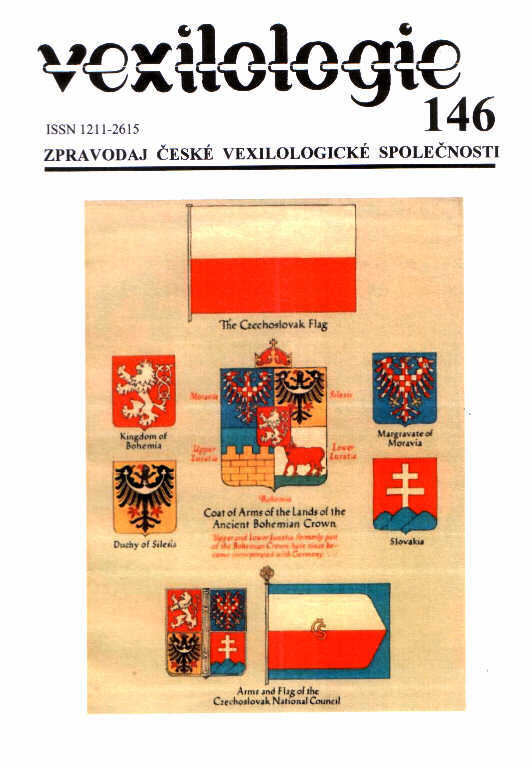 Other medieval aristocratic families ruling this region - the Rosenbergs and the Vítkovecs - are represented in the second field of the flag of South Bohemia. It is divided vertically in W/B and charged with R/Y paly rose with green perianth leaves and calyces of countercharged colours. The Bohemian lion reflects pertinence of the majority of the region area to Bohemia while Y/W pale in the third green field recalls the traditional merchant route connecting Bohemia and Austria and known as the Golden path and the Vltava River, the spring of which is situated amidst green forests of this region. The town of České Budějovice (Budweis) is represented by a white mural wall with three towers - the main element of its municipal arms. The Zlínský region is situated near borders with Slovakia and consists of three particular parts represented in the third golden quarter of the arms - two crossed blue sticks stand for Wallachia, a blue ploughshare symbolizes the fertile Hannah region, and a blue bunch of grapes stands for Moravian Slovakia. 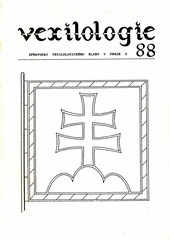 A golden eight-pointed star in the fourth blue quarter recalls the town of Zlín while a golden patriarchal cross and the blue Bible in the second golden quarter are symbols for the Greater Moravian Empire existing in central Moravia within the eighth century and for two saints (Cyril and Method) who brought Christianity to this pagan state. A yellow camel in the second field of green colour is the most interesting figure shown in the flag of the Plzeňský region - it was derived from rather compound municipal arms of the town of Plzeň (Pilsen). Pilsen citizens stole him to the Hussite reformists in the 15th century when the latter ones surrounded this town. A white Roman rotunda in the fourth red field shows the oldest Bohemian Christian building preserved in the town of Starý Plzenec. White and yellow bends in the third green part stand for waters of Berounka and the gold-bearing river of Otava. 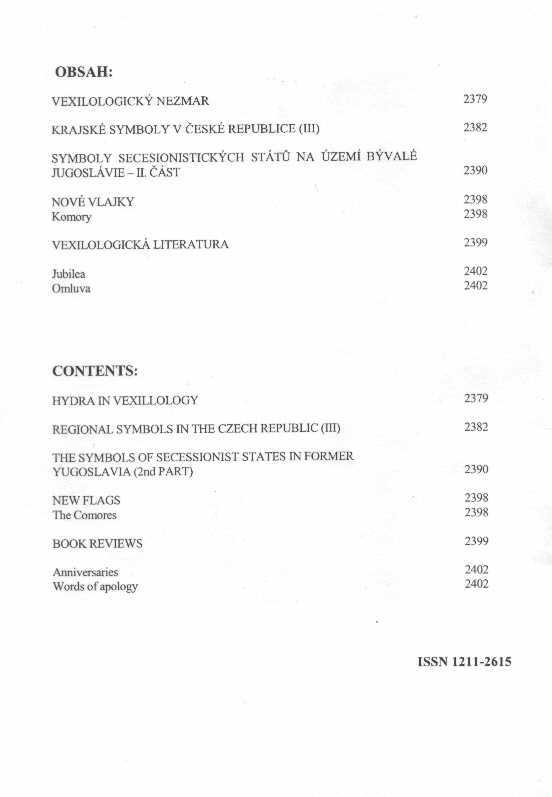 A well-known Croatian vexillologist Željko Heimer contributes to our periodical with his article on symbols of secessionist states in former Yugoslavia. However, some of those states were nothing more than utopic projects proclaimed by some parties, but never realized and soon forgotten. Those entities that de facto functioned as more or less independent states with all attributes are listed in this article. 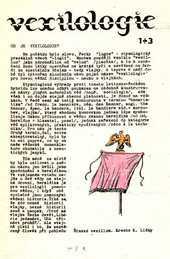 Symbols of the Serb Republic (Fig. 1, Fig. 2), the Croat Republic of Herceg Bosnia (Fig. 5) and the Republic of Western Bosnia (Fig. 12, Fig. 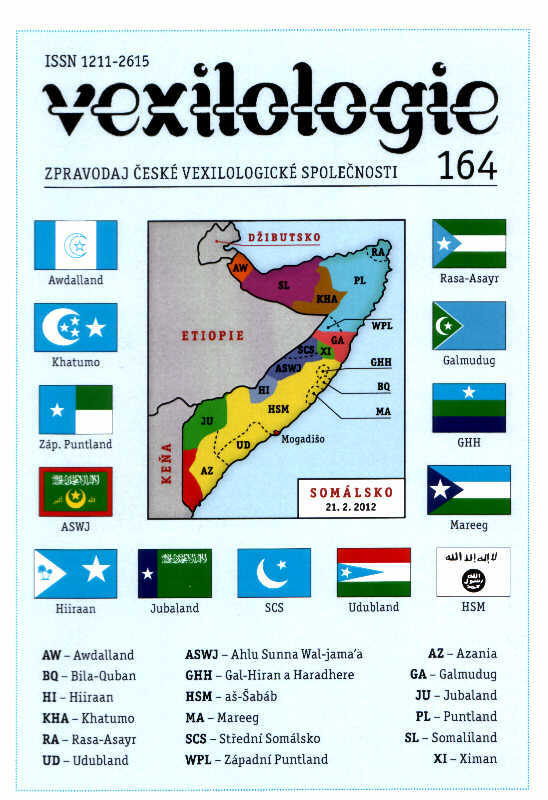 14) proclaimed in Bosnia and Herzegovina belong among those already well known. Also symbols of the Republic of Serb Krajina (Fig. 15) existing in Croatia are familiar to some vexillologists. On the other hand, the flag of the future state of the Albanians living in Kosovo named Dardania (Fig. 18), flags of Vojvodina (Fig. 20) and Sanjak (Fig. 21) may contribute to knowledge of our readers.